Only 30% of respondents are reporting an increase in footfall. This is an interesting switch from the 65% in January. However 40% are reporting that they have not seen a change. Online activity has seen a slightly higher increase than physical, but the response is still very mixed. 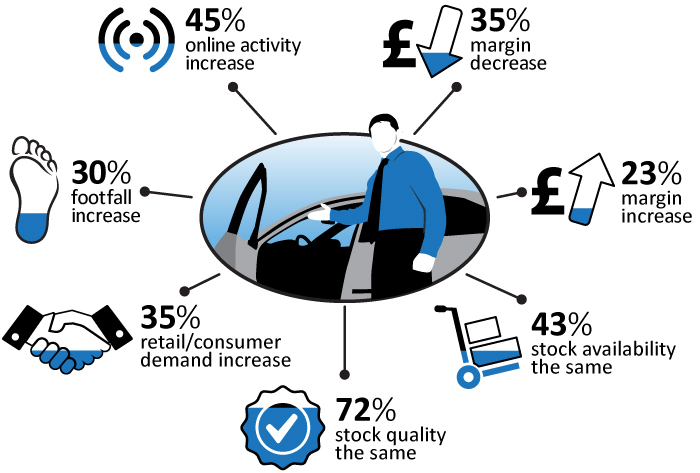 The concern around margin compression continues as 35% of dealers are still feeling pressure there. However 23% have reported an increase – this is in the main due to a profile or strategy adjustment. For example, no new year sale, etc. 43% of respondants are reporting that stock availability remains the same, although 35% believe that this has worsened since January – possibly due to the pre-Christmas hold back from the vendors? The quality of stock again doesn’t seem to be raising any concerns, as over two-thirds of dealers are reporting it has remained the same. Retail and consumer demand seems to reflect the online and footfall activity, with 35% reporting it has improved since last month but 40% saying there has been no change. And an over-whelming 78% dealers say they are not buying stock differently and that consumers are not changing what they purchase. This may still be early days, and this is certainly an area to keep a close eye on. The survey is done monthly, within a very small open window. This ensures that the responses are market relevant and current. The data in this survey is for last month (February 2015). If you want to be involved with The Market Survey for March (coming soon) – For Dealers, By Dealers - then feel free to contact CAP's Black Book Editor and Retail & Consumer Specialist, Philip Nothard.